Baby Kingdom Scoops BRONZE in Best of British in the 2018 Baby and Toddler Awards! We are delighted to announce, with the new arrival of the Baby Kingdom collection, we have received our very first award! 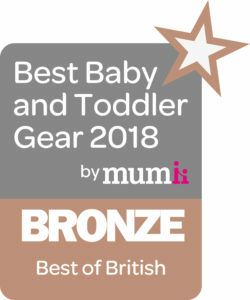 Baby Kingdom scooped the Bronze award for the Best of British, in the 2018 Best Baby and Toddler Gear awards. Following final preparations to launch Baby Kingdoms new UK website, we wanted to take the plunge and enter our 5 beautiful products into their very first awards! Best Baby and Toddler Gear cherry pick testers to put products through the test. So, what made us choose this category you may be asking? The Baby Kingdom design has been fully focused on all things British. We were passionate from the start to create a luxury, high performance, safe product collection, made in the UK, which shouts British. Baby Kingdom’s outer packaging delivers high end, recyclable cylinders with the union jack as the focal point and a luxurious silver foil finish. We have cut no corners with the airless pump product bottles, chosen for convenience and ease parents can appreciate whilst bathing their new baby. Baby Kingdom airless pumps are finished with a silver top and ooze style and class. We are especially proud of our innovative, talc-free, baby powder bottle. Moving away from the classic shaker bottles, the baby powder is dispersed via an airless pump spray. Don’t be deceived by the bottle size, due to the spray technology there is no waste with powder being evenly distributed to the desired areas. Baby Kingdom has been formulated and manufactured here in the UK, which has been a huge importance to the brand. As parents we are passionate to use safe, natural and organic ingredients, keeping the brand as clean as possible. We appreciate, when choosing baby products, your first priority is safety; a safe product which you can trust. We believe babies should smell like babies’, this has been considered when carefully handpicking fragrances. We understand babies’ skin is delicate and sensitive, which is why we have taken the extra steps to certify the brand as hypoallergenic and dermatologically tested. To ensure we deliver on all of the above, to the best possible standards, keeping our manufacturing here, in the UK, is essential, making the most of the state-of-the art chemists, not to mention supporting UK business! So, there you have it, entering Best of British was a no-brainer for Baby Kingdom and we hope this is the first of many awards to come. Stay in touch for our next blog coming soon, discussing the use of SLS and Parabens in hair and skincare products.